← The Love of My Life | Have We Left Our Mark? The past month has been an intense one. When I wrote “The Love of My Life | Have We Left our Mark?” at the end of July, I noted that my precious daughters headed east after our beach vacation. They headed east with Maureen’s mom and dad for time with both their grandparents and cousins, first in South Carolina, and then to North Carolina for time with my mom and dad, sister, brother-in-law and their “Thompson” cousins. Taylor and I not only headed west, but I realize now that I also headed inward. By closing my eyes and opening my heart this past month, my vision has both exploded and expanded. For those that follow me on Facebook, they know that the dragonfly was an incredibly important symbol during our time at the beach. I’ve been allowing this image of the dragonfly to “flutter” in my mind’s eye for the last several weeks, just like Heather’s dragon. Unlike the crystals of sand along the beach, Maureen’s ashes and the powdered donuts that led to Have We Left our Mark?, the imagery of the dragonfly and its symbolism was only just starting at the beach. Everything that has happened in the last month as I have looked inward is a part of the bigger picture and changing how I see. Dragons and dragonflies. The dragonfly is an incredible work of art and truly an impressive creature. In addition to its horizontal and transparent wings that allow it to fly in six directions, the dragonfly can “see” in dimensions that we as humans can not. Dragonflies have what are known as compound eyes. 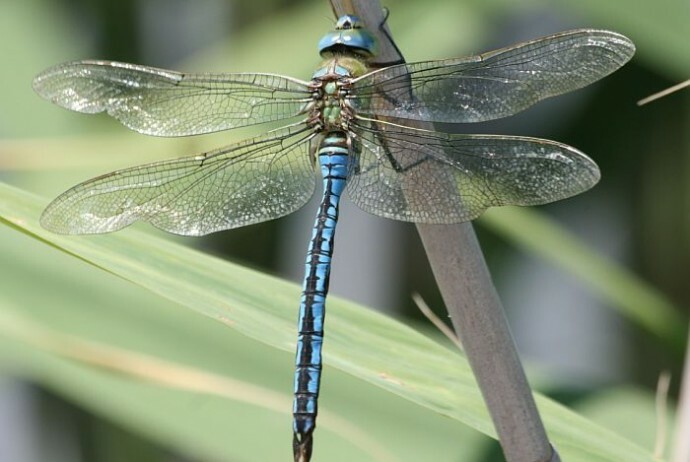 In addition to the compound structure that allows the dragonfly to see up, down and behind them, their retinas can see more than just the red, blue, and green of a human eye. The dragonfly can not only see four or five different colors, many that are beyond human capability, but they have more “facets” by which to process these images. Equally interesting is the brain power of the dragonfly that is dedicated to its sight. Not only does the dragonfly eye allow it to see 360 degrees around it, but 80% of its brain power is dedicated to sight. 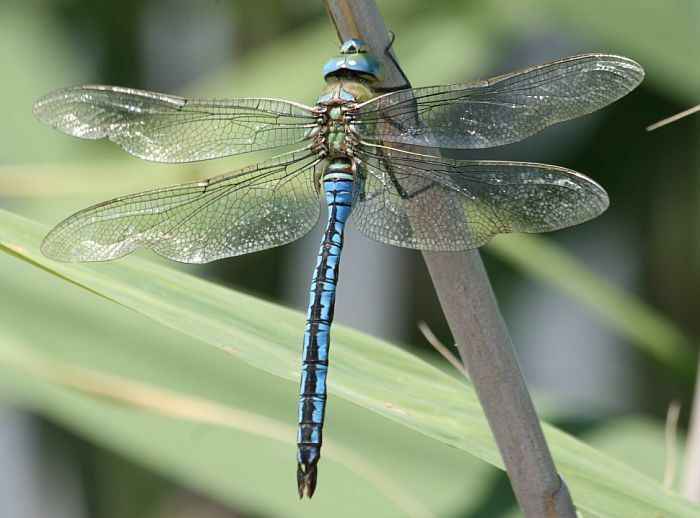 The dragonfly, in almost every part of the world, symbolizes change and change in perspective. As noted by the Learn about Nature website, the word dragonfly has its source in the myth that dragonflies were once dragons. I did not know any of this when a huge dragonfly flew into the beach house at Ft. Morgan, Alabama on the Sunday night we had arrived. For those that have read The Love of My Life | Have We Left Our Mark? you know that Maureen’s father acknowledged his wonderful daughter and my beautiful bride in a prayer over dinner on our first night. Rather than hide from the powerful emotions coursing through all of us, we honored the love we all felt for Maureen and from Maureen. Not long after dinner, a dragonfly flew in an open door. I didn’t think much more about this winged creature until the next morning when I awoke early to head out on one of my three 40 mile bike rides of the week. It was quiet in the house, so it was easy to hear things. As I put water in my bottles and pulled out some bananas and Cliff Bars for the ride, I was startled by a rustling sound. I could not figure out for the life of me what it was. Then, I saw it. It was the dragonfly. Its wings were fluttering at the edge of the windows, looking out at the water, wanting to fly free. Just like God had opened the door to heaven for Maureen when she flew home 9 months earlier at Seton Hospital in Austin, I opened a door to the house that allowed this dragonfly to be released and to fly free. That wasn’t the last of dragonflies at the beach. As if to be sure we “got it,” a whole fleet of them flew by the tent on the beach later in the week going from east to west, so many of them that it was simply impossible for us not to notice. And that is the thing about sight and “seeing.” How much of life do we miss because we simply aren’t looking at things in enough dimensions? How much of our sight is limited to red, green and blue? How much more could we see if we also used 80% of our brain for sight? As my new yoga practice has been teaching me in just the last few weeks, to see sometimes we actually have to close our eyes. We have to look inward. Heather had the courage to look inward and to see her cancer as something that was as much a part of her as everything else that made her a special gift from God. 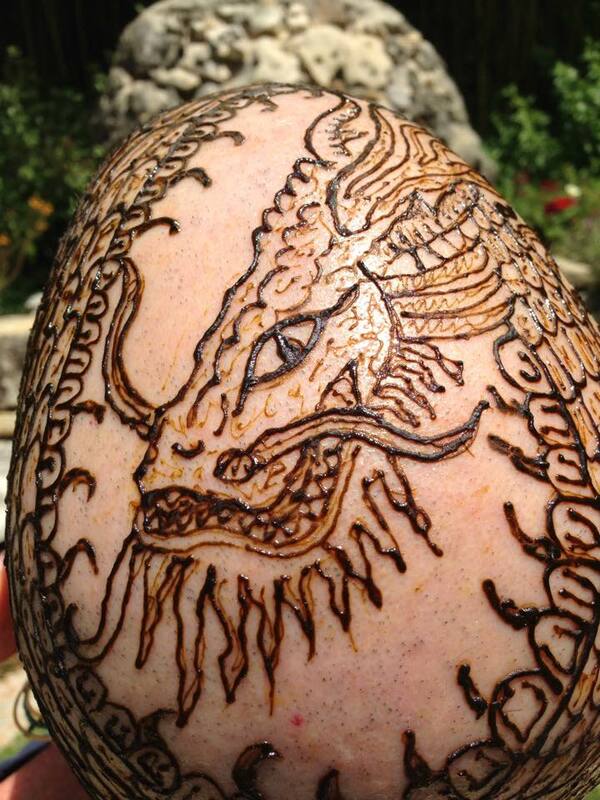 She symbolized her cancer, her dragon, with the amazing henna at the top of this post that adorned her gorgeous bald scalp. I am so thankful to Martin for this image, for his Heather and for him sharing the story of the dragon. 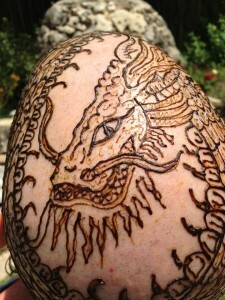 I am thankful because the dragon also connects to another deeply powerful image from my journey in the fight with cancer. I am bald because I love Kethan Kumar. Kethan would be an 8th grader this year, along with my daughter, Kyla. This courageous “little man,” as his mom, Sumithra, calls him changed not just my head but my heart. As this story from the Leukemia and Lymphoma Society about Kethan makes clear, Kethan had a form of cancer known as Acute Lymphocytic Leukemia (ALL). Although 85 – 90% of kids that get ALL survive, Kethan’s kind kept relapsing. In the summer of 2013, just before his 11th birthday, Kethan passed from this world to the next, releasing a human rainbow of one in the sky above his home. His celebration of life occurred a few days later on July 14, which is also the anniversary of my marriage to Maureen. I am convinced that this “connection” is more than just 2 dates that coincide on a calendar. Just like Heather Kohout, Maureen and Kethan never let their “dragons” change their flight. Cancer never changed the luminescence of their wings. They simply saw things differently as they flew through life. This is where it all comes together, from the posts I made in My Tribute to Kethan years ago to The Love of My Life to the Powdered Donut Manifesto to I Have Been Provoked. Kethan and I had a code word for cancer. We called it the jabberwocky. For those that know Kethan, they know he adored Tim Burton and that Tim’s movies carried him through some of the darkest moments of his treatments. One of Kethan’s favorite Tim films was Alice in Wonderland. It has become one of mine. 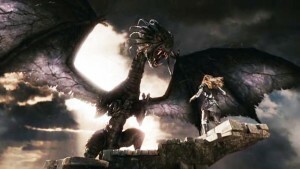 On Frabjous Day, Alice slayed the Jabberwocky with the Vorpal Sword. As I paid my last respects to Kethan in his home on the day of his passing, I promised him that I would forever remain his Alice, his champion, and that I would I would do all in my power to slay the jabberwocky, the dragon of cancer. However, as the last month has unfolded, and I have dwelled more on the meaning of the dragonfly, I am beginning to see the “slaying of the jabberwocky” in a new light, a new dimension. If Heather is right, that we each carry within us our own dragon, then do we slay it by killing it, like Alice, do we eradicate it, like we try to do when we “fight cancer”? Or, perhaps, instead do we go beyond our limited sight? Do we add “facets” to our seeing, like the dragonfly? Do we dedicate more of our “vision” to seeing by dedicating more of our brain to our sight? Do we see more by closing our eyes? When I close my eyes at the end of a yoga session, I begin to see. I see not just me, but I see Maureen, and I see love. And when I see love, I am suddenly able to see everything. I see both dragons and dragonflies.